Here is the best quote from the article: At that rate, state auditors found, total bus and rail ridership would have risen 46 percent in the past decade instead of the 57 percent. 46 Percent is still pretty good considering it was all TRAX on two single lines compared to the 6 counties of bus service. However, maybe Inglish's bonuses should be changed. How about a formula of: increase revenue per passenger mile, load factors, fleet utilization and the like? Here is another politician too caught up in his political agenda to do the right thing. To top it off this idiot is actually going to penalize the county, not the city who wants to to this by taking away county funds. Yesterday I posted videos about rail passenger service. Today is a couple of videos from the late Dr. Adrian Herzog and his marketing matrix. Very interesting videos showing by added additional segments to the existing long distance train network, you can greatly increase your ridership potential. Here is part one of the video. The video was originally from 1985 and not great quality but you get a good idea on the concept. Here is part two of the video. Part II talks about the current route of the California Zephyr, plus the trains that died in 1997 the Desert Wind and the Pioneer. With the election coming up, the future of rail passenger service is in question again. Almost since its inception, Amtrak has focused on the short distance corridors. However, is it the right direction for rail passenger? Here in Utah, we do not have any lines that would qualify as short distance corridors although UDOT tries to claim Logan to Ceder City is one but I would question that. This is video of Andrew Selden, President of the Minneapolis Association of Rail Passengers, runner up for President of Amtrak back when George Warrington was named, and supporter of long distance passenger trains. 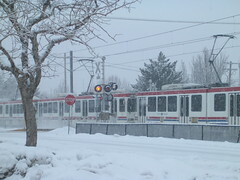 The UTA BRT line on 3500 South. For regular readers of this blog, you will remember that I have been critical of UTA and its BRT program on 3500 South. I thought it was a bad idea when the route was going to supplement the 35, now that I have found out they plan to kill the 35, it makes the BRT a bigger fraud than normal BRT schemes. No transit system that I know of has replaced regular bus service with BRT. They have supplemented the existing service not replaced it so UTA is in uncharted waters, and when it comes to bus service UTA doesn't do well in chartered waters. So what will this BRT bring to the table. Will the BRT create new markets? NO. The route will follow the existing 35 so no new markets are created. In fact by eliminated so many stops and making customers walk so far to bus stops they are actually loosing market not gaining it. This route carries lots of intermediate traffic. This route needs improvements but this is a down grade in service not an upgrade. This is an incredible waste of resources. As I have stated previously UTA would have been better off redoing curbs at important stops, assigning all low floor buses, and doing traffic light preemption. It would have cost less and improved the route more than what is being proposed. 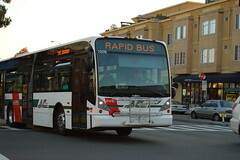 In addition they are buying a small fleet of Volvo buses like the one pictured being used by AC Transit in Oakland, California. Not only will create an orphan bus like the 1998 New Flyer Articulated buses, but these buses have been maintenance nightmares. UTA will have to have a special supply of parts just for these buses. It appears that UTA Customers are going to suffer in order for UTA to implement this project since they have the funding. This is bad transit policy, it is bad customer policy, it is bad marketing policy, it is bad public relations policy. UTA has a large number of these BRT routes planned. If they are planning on cutting all local service when they are implemented, then these projects need to be killed now, before we pay the price for bad policy. Rapid Streetcar instead of BRT? Yesterday I posted an article that talked about the proposal for a Bus Rapid Transit line in the Provo/Orem area. Here is one alternative: how about a Rapid Streetcar line. So what is a Rapid Streetcar line? Well it is based of the a streetcar operation but makes more limited stops. It does not have the infrastructure requirements of Light Rail, but is faster standard Streetcar. Here would be the route of the rapid streetcar: From the Orem FrontRunner Station via University Parkway, Sandhill Dr., 1200 South, 400 West, University Parkway, North Canyon, Bulldog Blvd/Campus Drive, 900 North, 900 East, Center, and University Avenue. While BRT is portrayed as a low cost light rail, however it is not true. If you compare an apples to apples system BRT is MORE expensive than rail, and does not attract the ridership that rail does. The nice thing about street car and rapid streetcar is that it can be upgraded to full Light Rail much easier than say a BRT line. In fact while many try to claim that BRT can be upgraded to Light rail, the truth is the cost of first BRT and then the upgrading cost there is no way that a BRT would ever come LRT except in limited circumstances. Brandon Plewe is wrong that Utah County cannot support light rail. The area is developing rapidly and once the transit line was in place it would quickly start attracting development near it. While Utah County is already getting a commuter rail line, a light rail line as an extension of the existing North-South line will attract different riders than the commuter rail as it has a different marketing matrix. Plewe is right that the way University is currently designed it does not promote the use of transit. But you don't say it won't work but redesign the street to make it more pedestrian friendly. A perfect example of this would be to put in pedestrian escape zones in the center divider so people don't have to cross all the way. That is called installing effective pedestrian design. Once again our roads are designed by road builders and think about pedestrians as an after thought and this needs to change. Our State Legislature is back in session so you know in the legislature's never ending quest for more power the annual attack on transit has begun. This year because it is an election year it appears that legislature is going after the bus system and not the rail system (those local legislators sure don't want to rile up the voters who support transit). While I am the first to say that the UTA bus system has many issues including the route system that is designed with "transit mentality" instead of market matrix passenger friendly system, it is clear from these annual attacks that the legislature is not happy that it doesn't have direct control over the system and is trying to figure a way to get it. The suggestions for the board will do little. The governor appointed chair would be tolerable but who thinks that it will not be some political hack that has a favor owed? Board members appointed by the legislature? Why should the legislature be approving board members when most of the legislature is from rural counties who usually only look toward their highway needs and not to the needs of the urban area. Having the public vote for members will not do any good. What is happened in many cities is that people have run saying they want a good transit system and in turn only wanted to get elected to dismantle the system or do serious harm. Besides that most people don't know who they are voting for in the first place, do you think it will be any different? What we cannot do is allow our power hungry legislature to do anything that will hurt the long term prospects for good transit service along the Wasatch Front. No surprise here, the skybridge was rubber stamped and will cross Main Street. It will be interesting to see how the complex develops now. Chances are it will be another Gateway that is designed to keep people inside the complex and not flow into the rest of downtown. Sadly once again the planning commission gives in and does make the tough decision and possibly not the popular decision. Just like the Smith's store in Sugerhouse the planners let the big company get what they wanted. Here is a picture of Downtown Des Moines, Iowa. For anyone who listens to the Doug Wright show, you heard him talk about how the downtown street level in Des Moines was dead, dead, dead. The skywalk system much like the one in Spokane killed the downtown street scene. I know some of you will say that it is only a single bridge. However, City Creek will be the focal point of the "new" downtown. 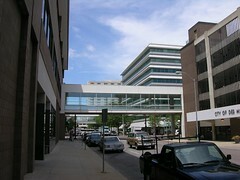 The Skybridge is designed to keep people solely in that development and to move traffic off of Main Street. To compare look at the Gateway project. That project was also designed to be inclusive and not include the immediate area. Everything is designed to keep people in the complex and does not create an environment that encourages people to walk into neighboring areas. In fact the most open area is the one that points people to 200 South where the homeless shelter is which also discourages pedestrian traffic. The city planners should be seeking a complex design that opens out to the neighboring areas, not locks them off. to everything except to what is to the north. What this must not become is a church or anti-Rocky issue. The issue is, will the City Creek development be like Gateway and lock the neighborhood off or will it become part of the greater downtown area and be an asset that will help bring more life to downtown. Article on the situation with America's Infrastructure. Notice also that the pro-highway, anti-transit faction was able to remove Paul Weyrich's "The Case for Public Transportation" out of the report. The last of the original bottlenecks in the TRAX system is slowly progressing on State Street. I think the Deseret News had a little boo boo in their article as it says 8600 S. State and I think they meant 7600 S. State. Here is a Youtube Video showing an inauguration of Tram service in Nice, France. What is interesting about the ice system is that while it has overhead wires over most of the route, there is three short sections in extreme historical areas where the trolleys run on a battery power. The reduces performance substantially but it is an interesting concept. Here is another short Youtube Video showing the arrival of one of the Nice trams at the end of the line. Well Ralph Becker made his first State of the City address and some of the things he address did sound good. First he mentioned the need for a city circulatory streetcar. This could be the start of a true streetcar system for the city. Second he mentioned the public market. I had a post a recently that mentioned the thought of a market and I would love to see it happen. It would allow a focus on local people not more chain stores. I have also heard that he also questions the skywalk and being an urban planner he should know the consequences of building it. 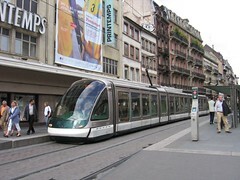 By the way the picture is another of the tram in Strasbourg, France. According to UTA figures ridership is up in select areas after the redesign. Now that is good news, of course what really counts is what revenue is doing and totally new riders not moved riders. The other thing that is not explained is which routes are being covered. There seems to be some pretty blanket statements being made. Lets look at the biggest increase and that is South South Lake. OK, what routes are we talking about here? There seems to be little specifics. How many are actually new riders or riders shifted from other areas do to cuts such as the service along 700 East? What constitutes service through South South Lake? Is the increase attributable to riders having to transfer were they had a one seat ride before? There seems to be a serious lake of data to back up what the UTA is saying here. This is one problem with transit systems in general is that they love to brandish ridership numbers but they don't tell the story of what is really happening to the bus service. Here is a video about what the problems that Seoul, South Korea faced with its bus system and what they did to reorganize it. There are some good ideas here, some UTA is already doing and a push for Bus Rapid Transit which is not the best of ideas. However, it is always good to see what has worked in other places in order to improve transit locally. 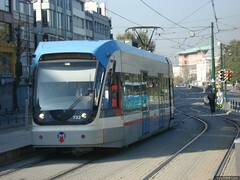 Here is a picture of a streetcar in the city of Strasbourg, France. 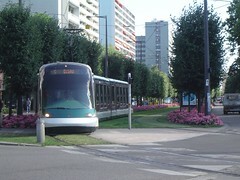 Notice the beautiful right of way with grass between the tracks, flowers along side the right of way and next to the tram station, and the trees creating a border between the Tram and auto traffic..
Now picture some of the proposals posted here in the past such as trams on 900 South and 400 West. You could have a nice green median trees along the right of way, and of course the flowers. Wouldn't this provide a much better image than the current one along 400 West or 900 South west of 200 East? What would need to be worked out is who would be responsible for taking car of the right of way but buy using water wise plants, it would make things easier. Some may bulk at the grass due to our climate but there are grasses that use less water or you could even use more natural growth. Either way, clearly treating the right of way like this on streetcar routes makes it fit more into the fabric of the community, makes the area more pleasant to walk around, and encourages a pedestrian friendly environment. Here is a youtube video criticizing the proposal to put express bus lanes along a major street in Jacksonville in order to create a BRT line. While some of the people quoted would probably oppose a streetcar or lrt line also, it does do a good job of pointing toward some issues with BRT. Here is a video from James Howard Kunstler who is an author and civic gadfly talking about main street and regulations that allow for bad buildings. He also talks about how the US cannot sustain the its current car culture. Video and Audio quality is not great. Thank you to Transit Miami who first posted this to their excellent blog. I will agree that these incidents are rare, but they are the fodder the anti-transit types need to start spreading how unsafe light rail is. This is currently happing in Portland were because of incidents in Gresham the anti-transit types are declaring how unsafe light rail is. Of course it doesn't fit into their political agenda that Gresham has had gang problems since even before the light rail line came in 1986. UTA does need to have a bigger security presence on TRAX. I noticed that security guards and actual officers are on almost all Denver light rail trains after dark. This gives a much better feeling of security. Attacks can happen anywhere as incidents in the last week indicate so it is better to be prepared and ready than to be sorry. Apparently the people riding the ski buses don't like the buses being packed although at 70,000 per month you are still only talking 2300 per day. Their complaints about the service point to some of the reasons why the service is such a waste of resources. Since the ski buses have a large number of seats removed to have ski racks inside the bus (this is true of the old buses also), there is very limited seating inside the buses. So the buses may be cramped even though the load would only be a full seated load on a standard transit bus. I have no problem with operating a ski bus service per say. However, when you have valuable pieces of capital resources sitting 8 months out of the year, you have an severe imbalance of human resource needs, added to the fact that you are not currently providing excellent bus service to the riders who ride with you 12 months out of the year, clearly something needs to be done. This is nice for those who have these devices although they are becoming much more common. However, UTA still needs to provide better information at the stations especially when there is problems. It seems when something happens, the communication breaks down. UTA and Motel Fire Alarm..
Great job to UTA and the driver who helped out during a fire alarm at a Motel 6. While it is sad that some idiot caused the alarm in the first place, it is clear that UTA came through and took care of the situation. Someone I knew email me this carbon footprint thingy and I gave it a try. Personally I think this thing is a joke. My wife and I have only one car between us, we drive less than 10,000 miles in a year, we recycle, keep our heat down to 66 degrees in the winter and have a useless swamp cooler in the summer. However it showed me as having a bigger carbon footprint than the country as a whole. Considering how many people in this country drive SUV's and other gas guzzling vehicles and I we have a Focus because of the Gas Mileage, you would think that it would be the other way around. Give it a try and see what you come up with. Pike Place Market in Salt Lake? Some people have mentioned that we need a Pike Place market here in Salt Lake City. We already have a farmers market at certain times but do we need something more? While I love Pike Place Market and a trip to Seattle is not complete without it, the is a Seattle institution and we should not in any way try to duplicate it. However, that does not say I do not want a place modeled after Pike Place. We can create our own public market place that but with a Utah character. Look at what makes Pike Place successful: only locally owned businesses are allowed in it and it focuses on what Seattle is know for. There is other small retailers located in the marketplace but it's big focus is on seafood. We could create a public marketplace that focuses on products grown and made here in Utah. Not only could it focus on the foods of the area but also the arts of the area. They could give local artist that often don't have a chance to make it into the galleries a place to present their wares all year long. In addition you could have plenty of room for restaurants that would be locally owned and other retailers. Another thing that makes Pike Place Market a success that it is very accessible, is pedestrian friendly and close to the heart of downtown. Many people venture over to Pike Place on their lunch hours. If we tried to duplicate Pike Place it would not work because it is unique to Seattle. However, we can create a place that focuses on Utah owned and grown and make a go of it.